Oecophylla smaragdina males preparing for nuptial flight, Thailand. Image credit: Sean.hoyland, Wikimedia Commons. “What the heck! ?” I spat, as an ant flew into my mouth. 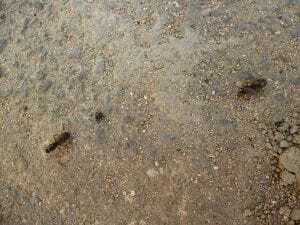 The winged ants were everywhere: crawling on the ground or (seemingly) flying dozily around. It was a warm and humid afternoon and I envied the laziness of the ants. But I had a tube train to catch and I hurried off without paying them much attention. It was only when I arrived in the centre of London and spotted more ants that I began to wonder what was happening. This was the U.K.’s famed ‘Flying Ant Day’ in which Queen Ants and the males take to the skies in their grandly titled nuptial flight. Although this annual event occurs wherever colonies of ants live, I had somehow never noticed it on the prairies of Canada–only discovering this natural spectacle about ten years ago while walking the urban pavements of London. The 2013 rush has apparently already started, with ants in places as diverse as Cambridge and Nottingham already having had their day in the sun this week. There have also been several seagull traffic deaths in Devon, caused by the gulls gobbling down too much ant acid. Last year, the Society of Biology enlisted the aid of “citizen scientists” to keep track of times, dates and weather conditions of sightings. What they found was that the nuptial flight occurs after a low pressure system and within a tight time frame, usually over a few days. The ants also make their flights between four and six in the afternoon. The idea of citizen scientists compiling data for a scholarly society strikes me as, perhaps, rather familiar: early modern Royal Society anyone? William Derham (1657-1735), for example, was a clergyman by day and a “citizen scientist” by night—specifically, an astronomer—who kept Hans Sloane and the Royal Society apprised of his star-gazing. (I discussed Derham’s interests in another post.) Derham also passed on observations from other people, including Mr Barrett’s* account of flying ants in 1707. I was lately at our friend Mr Barrets, who desired me to acquaint the Society concerning the Flights of Ants (that made such a noise in London last Sumer) that he hath for many years last past constantly observed the Flight of that Insect on the very same, or within a day or two of that very day of the Month, on which they fell in London. About the year 1689 or 1690 (as I remember) he said he saw a cloud of them, and several times since he hath seen the same. He took it for a Cloud full of Rain approaching towards him, & was much surprized to find it a vast Number of Ants only frisking in the Air, & carried aloft as he imagined only wth the gentle Current of the Air. He is of opinion that they allways come fromward the Westerly points. I hope our curious Members will for the future observe them more accurately, that we may make a judgment from what parts they came. The next day after they fell in London, I remember we had in divers places many of them, particularly at Mr Barrets, & South-Weal & Burntwood. I call them Flying-Ants, because Mr Barret (who is a good Judge) said they were such that he saw. In 1707, people were as fascinated by the sight of flying ants as we are today, with the Flight causing quite a stir in London in 1706. Although observers weren’t even sure if the insects really were ants, or why they were flying in a mass, they were clear on three points: that it was a regular annual event, that air currents enabled the Flight, and that it occurred on multiple days across the south of England. Over three-hundred years on, we’re rediscovering that Flying Ant Day is region specific in the U.K. and is affected by weather. It is intriguing that modern science still hasn’t explained the specific triggers for the Flight of Ants and has once again turned to citizen scientists to provide a larger data set for study. Despite Derham’s hope that “our curious Members will for the future observe them more accurately”, the Royal Society doesn’t appear to have taken much interest in the Flight of Ants. Maybe the Society of Biology will have more success. If I happen to spot the Flying Ants this year, I plan to take part in the Society of Biology’s 2013 Flying Ant Day survey. This time, I’ll follow in the footsteps of Barrett and Derham by closely observing the natural world at my doorstep instead of dashing past it. Flight of the Ants, 22 July 2013. Image: Lisa Smith. *Probably Dacres Leonard Barrett, a member of the Fuller family (relations by marriage to Sloane) and occasional correspondent of Sloane’s. Tags: citizen science, England, Flying Ant Day, Flying Ant Day History, history of biology, London, U.K.